Theatre company Filter's latest work in collaboration with the RSC and directed by David Farr starts with a cacophony of sound as we understand that Katy Stephens's character Kate suffers from tinnitus, hearing distressing noises inside her head. She tells us she fills her head with noise in clubs, with loud music, in noisy places to block out these distressing ringing sounds. 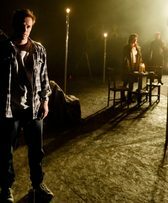 Silence is a devised piece set in London and Russia and worked on by Filter actors Oliver Dimsdale and Ferdy Roberts together with actors from the RSC ensemble. The free flow of the story and the characters suits Filter's way of working as they distil theatre into its essence and encourage the audience to use their imagination. In 2010 Kate is married to Michael (Oliver Dimsdale) an investigative documentary film maker who works with a sound recordist Peter (Jonjo O'Neil) trying to discover from a retired policeman, Kenneth (Patrick Romer) exactly what happened on a surveillance operation twenty years before. In 2010 Katy gets a tape through the post which sets her on a journey to find Alexei (Ferdy Roberts) her Russian boyfriend from 1991 whom she first met in Berlin as the wall came down. The company switch between the London stories and the scenes set in Moscow with an emphasis on the rich soundscape provided by Filter's composer and soundman Tim Phillips or by actors, improvising sounds and using microphones which descend from the flies. The sets are functional furniture but the lighting is on tall poles topped by a light bulb, Filter put the usual hanging lights and microphones on poles arrangement on its head to good effect. A side story has Peter listening to, and recording through the wall, Mary (Mariah Gale) an Australian girl living in the flat next door so that he knows what she is doing from the sounds she makes long before he meets her in person. Maybe it is the devised nature of the play that makes it feel fresh, allowing the audience to make their own connections and contrasts between a so-called free society and a repressed one, between the couples and their individual priorities whilst thinking about the sounds we make and hear. Sometimes this contrast is underlined in the acting when the same waitress moves between a smart restaurant in Moscow and a caféin Lewisham across a dividing panel, changing her demeanour and posture from welcoming and smiling to not giving a damn about her diners. Christine Entwisle has this comic role as well as the bolshy hotel receptionist in Moscow who is delightful providing you are not a hotel customer. Ferdy Roberts is the Russian lover Alexei, brutalised by the state and providing Kate with escape from her life and tinnitus, sad, nostalgic and damaged. Her husband Michael, played subtly by Oliver Dimsdale is absorbed in his job mostly unaware that his wife is absorbed in her past. Katy Stephens is a very fine actress and carries this part well. The silence of the title is also about the breakdown of letters and communication between Alexei and Kate. The end of the love story is cryptic and the political one has a different kind of silence. David Farr's state of the art direction manages these complex stories, often happening onstage with no break, and across the decades, with a bell-like clarity so that the audience isn't puzzled by what they are watching and can instead concentrate on how they feel. Silence is on at Hampstead for a very short time so don't miss it.